A recent survey mapped out the most dangerous places in the world to be a Christian. This year's list, recorded using a points system, reveals persecution of Christians is actually on the rise. - North Korea has been named the most dangerous place in the world to be a Christian for the 14th year running. - Iraq has replaced Somalia as the second most dangerous place to be a Christian. - Eritrea, now nicknamed the 'North Korea of Africa' due to high levels of dictatorial paranoia, follows at number three. - Afghanistan, Syria and Pakistan, in that order, comprise the next three most difficult places for Christians. - Somalia, Sudan, Iran, and Libya make up the final four of the top ten countries in that order. - From the rest of the countries, the lowest ranking country in 2013, Niger, had 35 points. This year's lowest ranking country, Oman, had 53 points, still an increase of more than 50 percent. - India, the second most populous country in the world, has seen persecution levels rise dramatically for the third straight year, rising to number 17 from a ranking of 31 in 2013. Lisa Pearce, CEO of Open Doors UK & Ireland, said: "This is a cause of great concern. Many countries have dropped down the list, not because persecution there is decreasing, but simply because others are getting worse faster." Pearce added with a mixture of concern and hope: "The persecution of Christians is getting worse, in every region in which we work - and it's getting worse fast. In many parts of the world, despite the pressure and the often terrible cost, the church continues to grow. There is always hope, and yet we are in unmarked territory - the pace and scale of persecution of Christians is unprecedented and growing fast." From an individual country perspective, North Korea is by far the biggest culprit and antagonist against the Gospel of Jesus Christ and Christians. Mansfield noted that in North Korea it is estimated 70,000 Christians are currently in prison or labor camps because of their faith- which is illegal under Kim Jong-un's regime. Christians are forced to worship in secret and risk torture and death to do so. In a separate report by Hollie McKay published in FoxNews.com, only a handful of mostly sick or elderly Christians remain in the ISIS stronghold of Raqqa, and Syrian Christians fear the forces that have brought that city's population of Gospel followers to the brink of extinction could do the same for the entire nation. 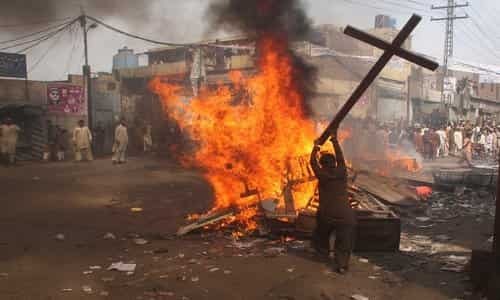 An estimated dozen Christian families are still in the northern city, forced under threat of execution to convert, pay an "infidel" tax or go into hiding. Forbidden from leaving, they are also in danger of dying from attacks directed at ISIS by Damascus, Russia, and the U.S.-led Western coalition. "We are trying to help them escape or stay safe, in hiding," said Ayman Abdel Nour, executive director of Syrian Christians for Peace. "Their life is horrible. The people of Raqqa are being forced to live like it was 1,400 years ago." The Rev. Ibrahim Nseir, pastor of the National Evangelical Synod of Syria and Lebanon and the Presbyterian Church in Aleppo, told FoxNews.com from the conflict-torn city: "We are facing terrorist action in the whole geography of Syria...They are destroying our churches, killing and kidnapping Christians, stealing our homes and our businesses." Based on these reports, it would seem that Christians within the West are much safer. Not quite - as a recent reminder by Chris Tomlinson for breitbart.com would indicate. Tomlinson's report makes reference to a new study showing that potentially thousands of Christians have been attacked and harassed in German migrant homes by Muslim guards and fellow migrants. Markus Rode, a member of Open Doors said that the study is only "the tip of the iceberg" and called for more action to address the problem, Frankfurter Allgemeine reported. Volker Baumann of Action for Persecuted Christians (AVC) claimed that up to 40,000 Christians are being persecuted for their faith in Germany according to the group's research. It's not just in Germany either. According to Breitbart London reports, Christian refugees now in European asylum homes are finding more and more that they are in as much danger from radical Muslims in Europe as they were in their home countries. Most attacks include verbal insults, physical assaults and death threats against themselves and family members. In Berlin, Christian refugees were threatened after they refused to take part in Islamic prayers with Muslims from Iran and Afghanistan. About 80% of refugees surveyed say there's a need for separate accommodation for Christians and Muslims. Others say seminars should be held for all refugees on German law, rights and the freedom of religion. However, the words of Jesus still ring true today, more than ever before regarding His church: "...the gates of Hell shall not prevail against it". (Matthew 16:18b).